"Autumn Trees #4" oil on linen, 6x9"
For the past week, I have been drawn towards the outdoors. I spent a long time walking around Easton with my easel-backpack, looking for a quiet spot to paint, a spot that had exciting shapes and colors. Autumn is so cold and melancholy, with an aching beauty, heavy with mortality. So, it's no surprise I was drawn to the Easton Cemetery, a place where I always feel very peaceful. Everything about this cemetery speaks peace to me. I wanted to be alone. I wanted to feel the quiet stillness pressing around me on all sides. I returned day after day, content to spend a long time mixing colors, laying down shapes, scraping them away, and doing it again. Reality begins after 3 large simple masses are the correct value, chroma, and temperature. "Autumn Trees #1" oil on linen, 6x9"
Of course, I never really was able to stay with the three simple masses; I kept getting distracted by the autumn colors and it was so tempting to add more details. But it helped me to begin that way, and try and return to that good beginning place as often as I could, even if it meant scraping everything away. 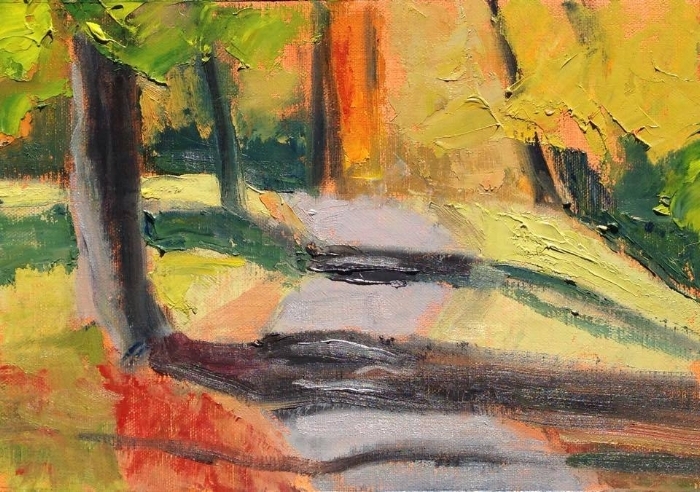 "Autumn Trees #3" oil on paper 5x7"
I painted near my Ukrainian great-grandparents' graves. Here is the grave of my Baba (my great-grandmother). Her name was Neonila Wengrshenowsky, but I suppose it was too much trouble to fit the whole name on the tombstone. She died when I was four, and I can still remember her. She was patient, with long white hair piled on top of her head. I remember sitting next to her at a desk while she showed me how to draw a house with a pencil. I find that I am more joyful when I put paint down with a palette knife, rather than a brush. I feel so excited by putting paint down thickly. I think that I would be quite happy to be buried in this cemetery someday, with its large trees and winding paths. Maybe, if I don't make it into heaven, I can be a ghost painting here.